My thoughts on the different tilesets for cities and settlements: which ones we have, where they can be used, and what we will need. This is the tileset as it occurs in Morrowind. it is probably easiest to think of it as "Imperial Colonial Style": the kind of quick, inexpensive construction used when setting up towns in the provinces. We will most likely have little use for it in Cyrodiil, except as "default" architecture in the rare situations where none of the regional styles would fit. This kind of architecture is explicitly Colovian, built by soldiers and colonists who hail from that region. The tileset used for the city of Stirk. Having a unique tileset for one single location is a waste of effort, unless if it is a place of special significance (like the Imperial City or Sancre Tor). Ideally, the entire Gold Coast (Stirk, Anvil, Brina Cross, etc.) should have used the same tilesets. In the future, we should avoid these kinds of design choices. The tileset used for the city of Anvil, the upper quarter of Sutch, and all Colo-Nordic Manors in the Gold Coast and Gilded Hills regions. Technically, this should probably be considered two different sets: a rural shack type for the poorest villagers, and a brickwork type in the common/vanilla style. Used for Gold Coast settlements, farms, fishing huts, etc. Brina Cross, Thresvy, and the lower parts of Sutch all feature this set. Similar to the Gold Coast rural set, both the brickwork common set and the lower-class shacks. We would be able to use this style for the entire Highlands: upper Kvatch, Chorrol, and the Barrowlands. 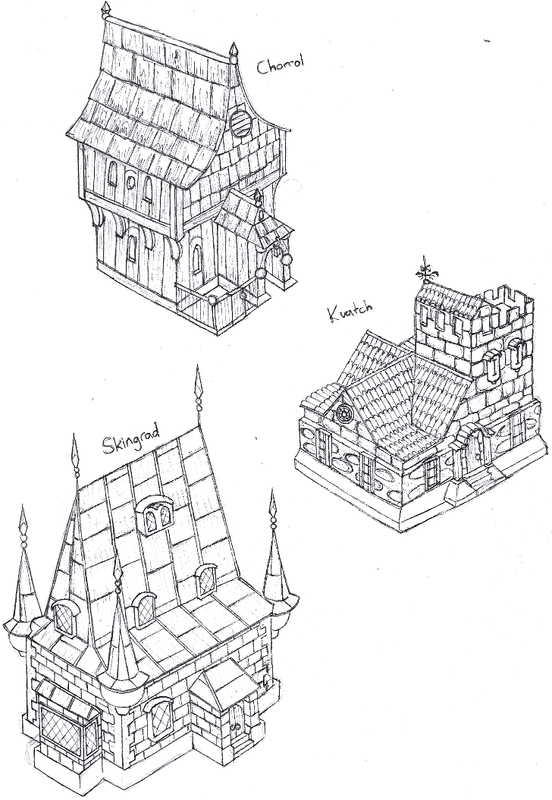 The set would mostly consist of rough stone, perhaps with slate roofs instead of wood or thatch. This set would be used for the major cities of the Highlands, Kvatch, Mohrlagrad, and Chorrol. The typical Colo-Nordic cliff-forts will also be made of this set, and might even deserve a couple of unique assets (towers, walls). The popular style found in the Massiquerran Forests, the Chorrol lowlands, and the West Weald around Skingrad. Sort of a Mediterranean farm look, uses mostly wood. Since the environmental factors of these regions are mostly similar, I think it would make sense to use the same style for the Chorrol and Skingrad rural areas, despite them having different urban styles. The style of lowland cities such as Skingrad, Sarchal, and Dethagrad. Strongly Mediterranean, with influences from places like Mont-St.-Michel. Farmhouse style for the Jerall mountains. Mostly wood, strong Nordic influence. The style of Bruma and Artemon. Also very Nordic. These mountain styles could perhaps also be used for the eastern Valus mountains. The style of the rice farms and lesser villages of the Heartlands and the Niben river. Since the Nibenay is much more urbanized that Colovia, I think it makes sense to use a single rural style and focus on variations in the urban styles. Pole-village style of isolated Nibenese tribes in the inner jungles. Used for major cities along Lake Rumare, as well as the City itself. Considering the importance of the IC, it would make sense to have tileset variations for poor houses, middle-class houses, upper-class manors, and the Emperor's Palace. The Cheydinhal urban set, drawing inspiration from Dunmeri examples. The style of Bravil and the Valley of Altars cities. Dense, urbanized, mostly made of wood. The style of Leyawiin, Topal bay, and the Molaquin Ren. Strong influences of Khajiiti architecture. This tileset includes both rural shack houses and common-style brickwork. This is a tileset that can be used economically, as this housing style can be used for different locations across the next two release areas. We should predominantly feature this set in Gold Coast settlements and farms, and maybe even in the Kvatch area, to tie this region together culturally. Perhaps it should have been split up in two different tilesets. Personally, I think the poorer rural shacks could be used across Colovia, similar to how Dunmeri wooden shacks are used in many different environments in Vvardenfell. I would like to see the common-style houses used as a secondary architecture for Kvatch. The shacks should be used for the fisher towns in the goldcoast and as secondary architecture in Sutch. For the rest of Colovia, I'm not sure. These houses are relying on the presence of palms in the environment. They could continue into the westweald a littie bit, maybe. I've complained about the use of the Stirk and Anvil wall tilesets before. If it makes little sense to have a different tileset for each settlement, this goes double for these unique walls, especially because their textures and architectural style does not relate to the building style of these cities or their fortresses. Compare this to Balmora or Ald'ruhn, where the wall set is in the same architectural style as the city itself. As such, I believe that the Stirk wallset should be retextured in the same style as the houses. I'm not sure what should happen with the Anvil wallset: personally, I think they are too bulky and bloat the city without really adding anything. I would propose replacing them with either the Stirk set, or the retextured Imperial fortress set (which would visually connect them to the castle). There is already a fairly consistent color scheme between the Stirk houses and the Stirk walls. I don't see a need for changing them. After some doubts, however, I tend to agree about the Anvil walls. Either replace them with the legion walls or alternatively ask for those anvil walls by beyond Skyrim. I also agree, somehow, that the distinctive architecture between Anvil and Stirk is a waste of some kind. But to me the Anvil houses are ugly beasts, whereas the Stirk houses, after my modest efforts, have become bearable in appearance. Edit: Maybe the the stirk docks could be reused in Anvil, after changing the wall texture on the Anvil houses for the one of the Stirk houses, which would pull Anvil a little bit into the purple color scheme Stirk is using. Just a possibility. Edit: Apologize for the conceited attitude expressed above. I agree that the Anvil wallset and docks should be replaced by the Stirk models, since they're of a higher quality than the unique Anvil stuff, IMO. However, I do believe that having distinct texture sets for each city is both acceptable and desirable - since for most of these it's basically a matter of tweaking resources from textures.com, it's far less time consuming than modelling brand new pieces for each city. For the shacks, I can easily put together a more traditional thatched roof as a variant so we can continue using them into the highlands. Infragris, how do the existing housing concepts fit into this proposal? For the Highland shacks I think a rough slate roof would be appropriate, sourced from local materials. Thatch roofs can feature for the lowland set. I don't really have a solid concept for the urban styles myself. 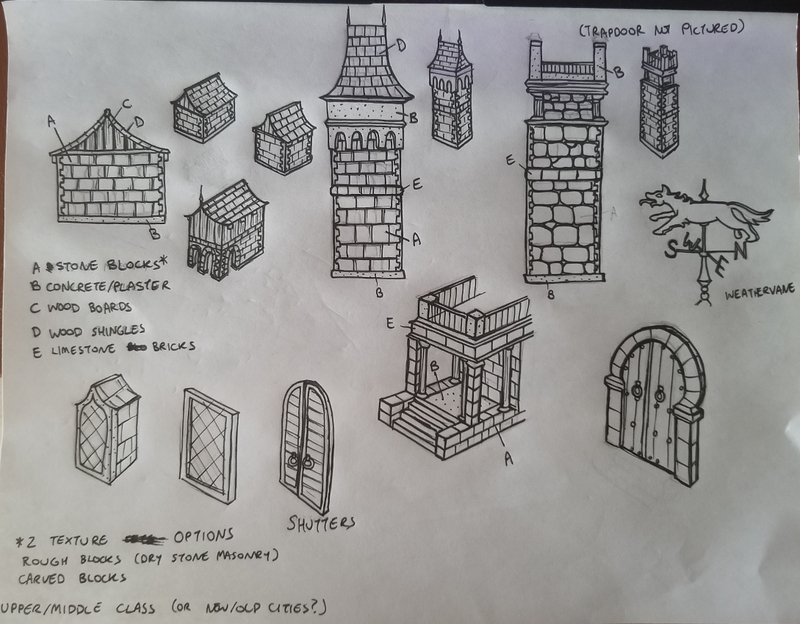 I like the Skingrad design, but the Chorrol one is perhaps a little too rustic for a major city (it might be a good inspiration for the lowlands rural style, in the vein of the current Gold Coast brickwork houses). Perhaps it would be best to focus on the Highlands urban styles first, though, especially if we whish to use this set for the Colo-Nordic manors (opinions?). There's some stuff in the region inspiration thread about architectures. Updated OP, removed some useless talk. That looks like a good source of inspiration. Are you going to base the model on the Anvil houses? I'm trying to avoid making it too similar to Anvil - by the time we get to the Highlands, we will have already used that tileset for three major cities (and probably some smaller ones too), and this tileset will get an equal or greater amount of use, so I'm going to trying to switch up the silhouette as much as I can within the constraints of having four walls and a roof lol. Okay, so here it is - first pic is the individual pieces deconstructed, second pic is an example of something that could be built using these proposed assets. I went for a mix of wood and stone and avoided plaster and those tiled roofs, in order to avoid similarities to the Gold Coast assets. Disregard the note about upper/middle class distinctions, since texture set will most likely be determined by the city rather than on a building-by-building basis. ESO did a horrible job differentiating the Bretons from the Imperials (using basically the exact same visual references that Oblivion used almost a decade prior), so I'm not super concerned about its depiction of High Rock tbh. Yeah, but it still kinda too remind me hr buildings from df and it contain also northen europe thematic, dunno. Maybe add more stone elements, different roof, add different windows add merlon to make it look more cyrodiilic? Make the buildings bulkier, base size like the Anvil set. Unsure if this is your intention, it's a bit hard to tell with the window sizes, if this is supposed to be a one- or two story house. 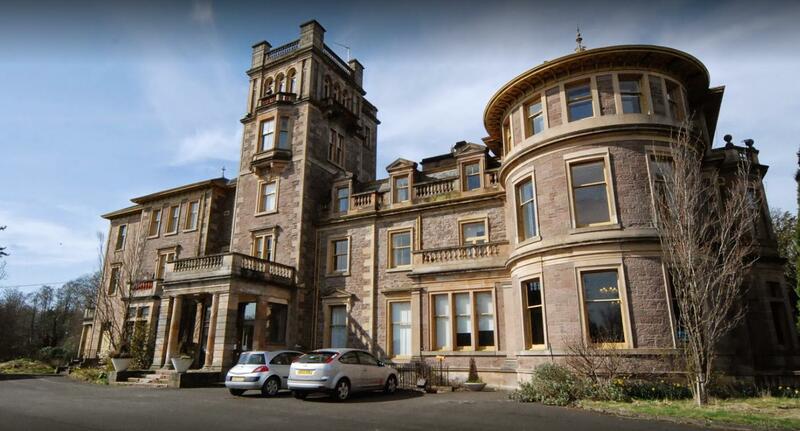 I wouldn't be afraid to use plaster here and there, or have slight variations between houses. Would make it less repetetive in the long run, and help differentiating between high end and poorer/run down districts. Like the difference between the last two images in Infragris' post. I wouldn't worry about similiarities between this and the GC set, I'm sure they wouldn't look alike unless you use the exact same textures. The plaster here would be more grey IMO. Having different weather vanes would be very cool. Perhaps a simple non-ornamental one, and then a few more elaborate ones like the wolf in your concept. 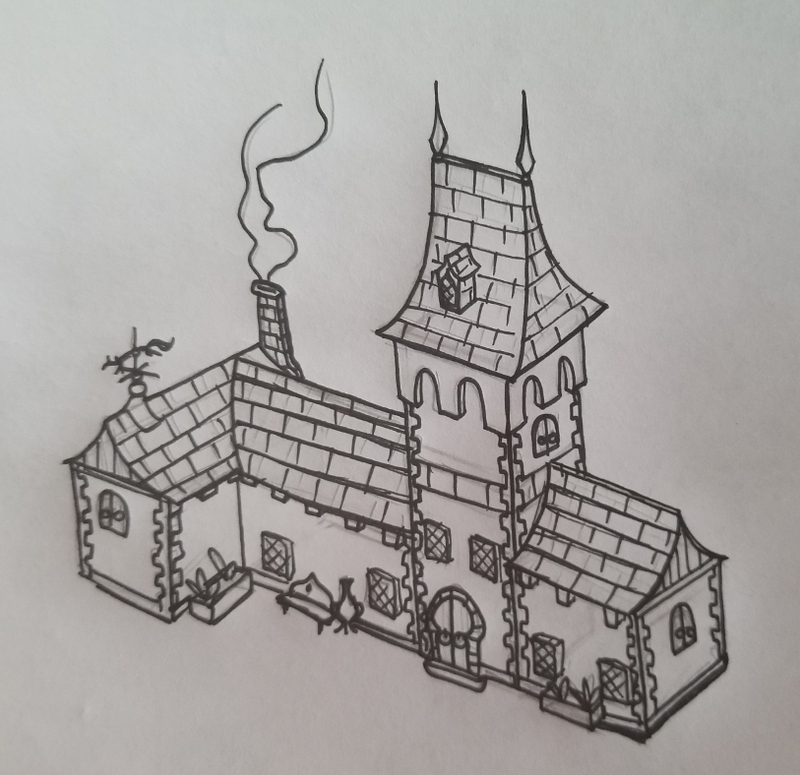 I'm working on some additional concepts that will better conceptualize the scale of these houses, but generally yes, they're roughly the same size as the Anvil houses. Main difference in terms of footprint will be that they're a little wider and shorter - aside from the towers, the tallest buildings will be two stories high, compared to three in the Anvil set - since the Highlands are colder and windier than the Gold Coast, their architecture will generally be kept lower to the ground to conserve warmth. The houses and shops are built in the Western Imperial style, and Pelagiad looks more like a village in the western Empire than a Morrowind settlement. It's a pleasant little village. If you didn't know better, you'd think you were in Daggerfall or some other High Rock town. Caldera has the appearance and flavor of a Western Imperial town. Stone blocks and wooden shingles are a really fitting element as these are found throughout the Imperial and Common building sets. Came across this recently, I think a southern Italian style like in Matera might be an interesting compromise between the overt medievalist and the more outlandish inspiration sources. Huh. I was looking at the exact same thing a couple of days ago, but forgot to post it.